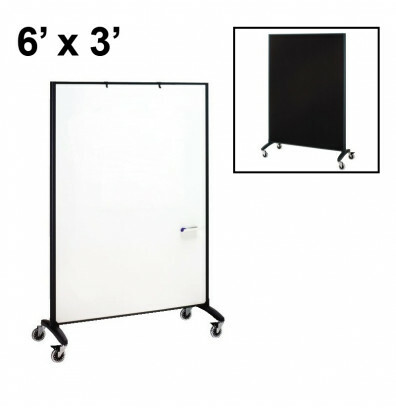 Quartet Motion 6' H x 3' W reversible mobile room divider offers a dry erase whiteboard surface on one side and a fabric bulletin tackboard on the other. 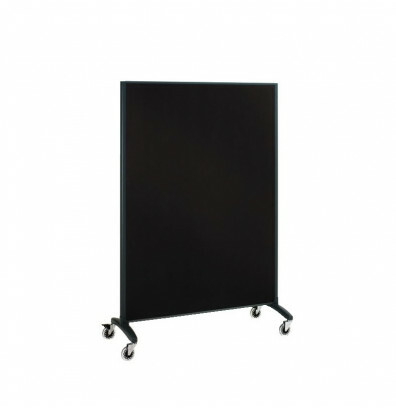 Also functions as a convenient way to create a wall to divide the space in a work or display area. Detachable accessory marker tray for increased storage. Includes wheels with 2 locking casters for smooth, controlled mobility. Recommended for high-volume use. 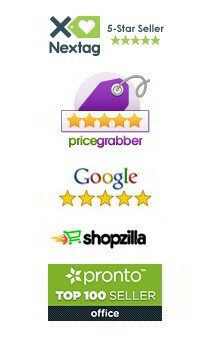 Dry erase writing surface is scratch, stain, and dent resistant and will not ghost. Accepts magnet accessories for posting aid materials. Fabric bulletin tackboard on the reverse side provides added posting ability. Tackboard surface is self-healing to eliminate unsightly pin holes. Porcelain steel dry erase writing surface on one side, a fabric bulletin tackboard on the other. 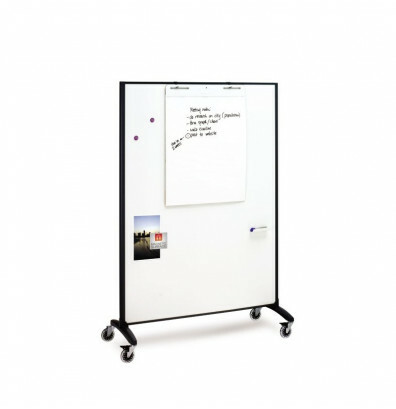 Whiteboard surface is scratch, stain, and dent resistant as well as ghost free. Writing surface accepts magnets for hanging extra materials. Self healing fabric tackboard maintains a handsome surface. 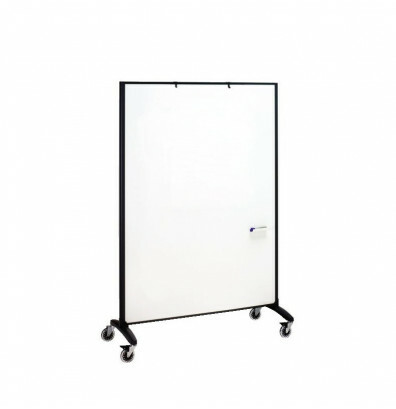 Holders can used to hang a flip chart on the board surface for increased presentation ability. Magnetic accessory marker tray can be repositioned to suit individual preference. Able to be used as a wall to easily divide and organize spaces for added customization. Smooth mobility wheels with 2 locking casters. Includes accessory marker tray, eraser, 4 color dry erase markers (1 red, 1 green, 1 blue, and 1 black), and flip chart holders. I am absolutely thrilled with these white boards. The quality is amazing. They're good looking. And I love how they nest when not in use. I have a small office with no wall space, so the design of these is perfect. I pull them out when I need them, and they take up little space off to the side when I don't need them.